We eat a lot of rice in our house at least 3 times a week. Perhaps you family is like mine and always has leftover rice in the refrigerator which after a couple days starts to get dried out and doesn't taste good. I hate wasting food and throwing out, so here is a recipe I use. It is simple, quick and makes a great dessert. Combine cooked rice, milk sugar and salt in a medium saucepan. Bring to a boil, then lower the heat to a simmer and stir in the vanilla and raisins. Cook until just about all of the milk is absorbed(30-45 minutes,depending on how absorbent your rice is). Stir in cinnamon and/or nutmeg, if using. 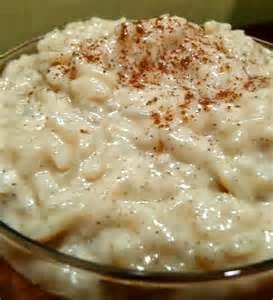 Divide rice pudding into individual serving dishes serve warm or chilled. * Note: Sometimes I add a extra 1/2 cup of milk, if the rice seems unusually form or dry, to make it creamier. You can add a bit of extra if the pudding is not as creamy as you like it. You can use nonfat, whole or soy milk in this recipe.